A Mission woman wishes she had paid more attention to some warning signs before laying down her hard earned cash and hiring a renovator for her home. Kristin Parsons trusted a home renovator she met at a home show to do a big job on her house but now she wishes she hadn't hired him. She says he walked off the job leaving a mess behind and thousands of dollars worth of work that needs to be redone. "All of the new siding. New stone. New deck. All of this was done incorrectly," she said as she pointed to areas of her carport she was enclosing into a garage. An independent report confirmed the work was not done to code. And necessary permits weren't obtained for the front steps and enclosed carport. "He said if you just put walls up you don't need permits," said Parsons. That's a red flag. The District of Mission says permits are required. But now the contractor has walked off the job leaving a mess behind. "He keeps promising to come back but he's not. I've got contractors saying this is not right," she explained. Parsons paid nearly $30,000, and according to an independent assessment of the work from a qualified registered B.C. homebuilder she'll have to spend thousands more to fix problems and to bring the work up to code. CTV News showed the report to Bob de Wit with the Canadian Homebuilders Association. "It's a ton of red flags. It just shows there's a lack of quality in their workmanship," said de Wit. 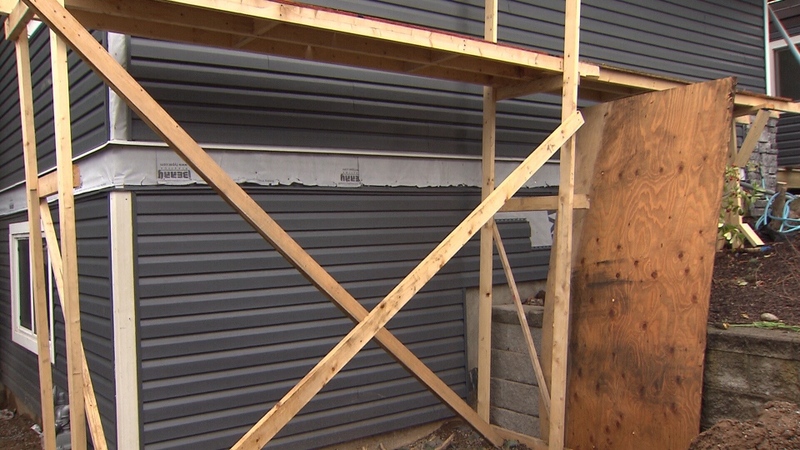 Like the flashing under the windows that the report says wasn't done properly, or the vapor barrier in the wall being lightweight and not to code. De Wit also saw a red flag in the contract. There was a clause for clients not to slander or give negative reviews. "When you see something like this it should cause you to run in the opposite direction," de Wit claimed. But it's too late for Parsons. De Wit says his best advice moving forward is to find renovators held to a higher standard. "In our association we scrutinize the renovators who apply to our association for membership," he said. He says to look for renovators with trade affiliations which would hold them accountable. Ask for trade certificates, establishing a higher degree of competency, talk to other customers who've had work done and look for a track record with organization like the Better Business Bureau. "It's really key that you choose a renovator who's got some track record and is part of an association because that shows they are willing to stand behind their work," explained de Wit. "I'm a single mom,” said Parsons. “I don't have a lot of savings to do this. It took me years to save up to be able to do this reno and it's literally drained my savings." Now she's locked in a dispute and will likely have to go to court if she can't get the contractor to return to the job. Parsons met her renovator at a home show. Some home shows vet their participants and some don’t, which is why it’s important for you to do your own homework before hiring someone.